February might be the off-season for tourism in Barcelona, as it is still quite chilly here. Don’t get thrown off by this though, this month is full of traditional events, festivals and activities (far better than the cheesy Valentine’s day! 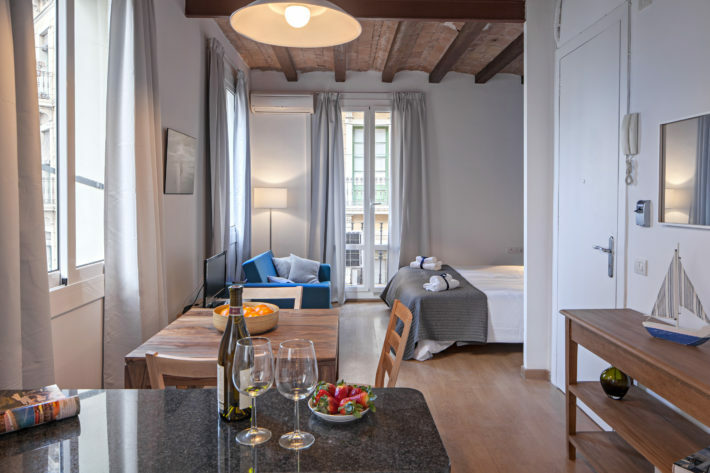 ), and keeping in mind the friendlier accommodation rates as well as airfares, it is well worth visiting and celebrating the end of winter here! A parade, a cultural fair with various food stalls and a number of shows will mark the arrival of the new year of the pig, celebrated by the 20 000 members Chinese community in Barcelona. 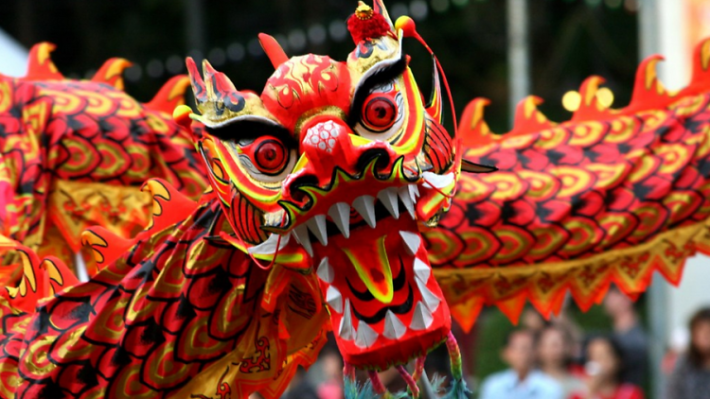 Get ready for the countless dragons – symbols in both China as well as Catalonia! 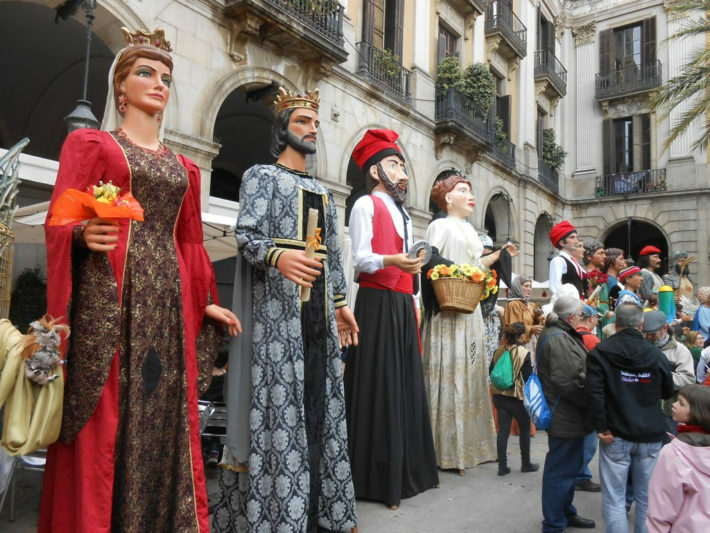 The Santa Eulàlia festival, also known as La Laia is a popular Barcelona’s winter festival. This festival pays respect to Saint Eulàlia, a 13-year-old girl who fought against the Roman Empire and thus became a symbol of solidarity and the defense of justice. According to the myth, the Roman Emperor Diocles ordered a persecution of all Christians in Spain, and while many fled and hid away, Eulàlia stood up and fought against the injustice, which cost her life. During this festival, be ready to see various performances, such as parades, the traditional human towers, Sardana dancing, and a fire run involving small and large fire beasts and devils. A spectacular light art festival comes back to wow the spectators again! Barcelona's schools' of art, design, lighting, and architecture students will put up an innovative show of lights and technology. You can explore the art yourself or join guided tours with others! The Carnival begins with a big feast day on Thursday, commonly known as the Greasy Thursday (Dijous Gras in Catalan). 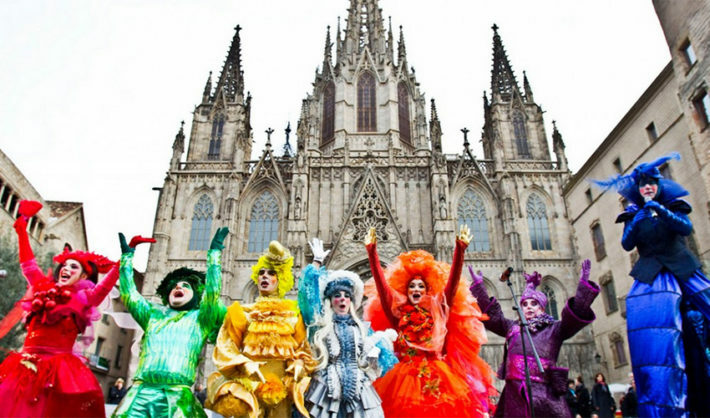 Traditionally, Friday marks the arrival of the Carnival King (Rei Carnestoltes), but in Barcelona, the festivities start on Saturday with the Carnival King’s speech about all the main events during the year and a call for everyone to come together and have fun. There are parades happening all over the city. Sunday afternoon/evening the taronjada (orange fight) and the big sarau (masked ball) take place. Especially in El Born/La Ribera, you will experience a big colourful battle of orange balloons and confetti at the end of the parade. On Ash Wednesday, the festivities come to an end with the burial of sardines and the death of the Carnival King. During this day, locals traditionally eat fish. Locals might also head to the nearby town of Sitges, where the Carnival is taken very seriously! The guitar festival is a major annual event putting spotlight on the guitar world. Every year the line-up includes the best of the best artists and groups. Concerts start at the end of January and take place all throughout February, find the programme here. Too many things to do here not to visit Barcelona this February? Agreed! Check the list of apartments we offer here and start planning your daily activities!